Bold Strokes Books, 9781602826700, 246pp. 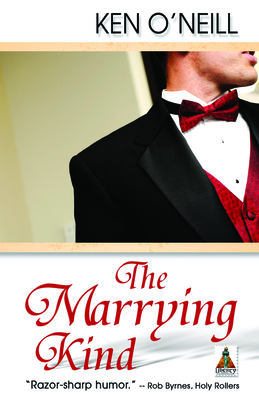 Wedding planner Adam More has an epiphany: He has devoted all his life's energy to creating events that he and his partner Steven are forbidden by federal law for having for themselves. So Adam decides to make a change. Organizing a boycott of the wedding industry, Steven and Adam call on gay organists, hairdressers, cater-waiters, priests, and hairdressers everywhere to get out of the business and to stop going to weddings, too. In this screwball, romantic comedy both the movement they've begun and their relationship are put in jeopardy when Steven's brother proposes to Adam's sister and they must decide whether they're attending or sending regrets. Ken O'Neill was born in Bridgeport, Connecticut, to an Irish Catholic father and a Romanian Orthodox mother, which means that most years he had the good fortune to receive Easter candy not just once but twice. Ken lives in New York City with his partner and their two cats. When he's not checking his Amazon rating to see if anyone has purchased his book, he enjoys reading, dancing (though usually when no one is watching), and eating dark chocolate, purely for medicinal reasons.